Learn more about the Port Stephens region. 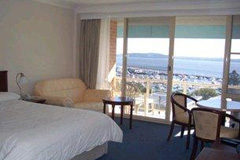 Port Stephens has a wide choice of accomodation from budget to pure luxury. Explore a world of beautiful destinations in Port Stephens. Enjoy a wide range of experiences at Port Stephens. A boutique hotel in the heart of Nelson Bay. Marina Resort is a vibrant boutique motel overlooking Nelson Bay Marina in the Heart of beautiful Port Stephens. Check for the best room rates and book online. See other hotels in Port Stephens. The Marina Resort is ideally located to all the major tourist attractions in Port Stephens and an easy walk down to the beach and cafes. Relax on your private north facing balcony & watch the sunset over the bay or cool down by the pool. Just 2.5hrs drive from Sydney and 25mins from the Newcastle Airport, it is a wonderful getaway destination. The property also has access to local activities like deep-sea fishing, bushwalking and whale and dolphin watch cruises. The resort has 44 guestrooms that are well furnished and equipped with standard amenities. Marina Resort Restaurant is open to the public, situated on the top level of the Marina Resort and has fantastic panoramic views of Port Stephens. Marina Resort has many on-site facilities such as function rooms, swimming pool, spa and sauna. Marina Resort is a modern high-rise set in landscaped gardens with magnificent water views just 5 min walk to the shops and beach. Port Stephens Australia is a 'Web Magazine' website that is dedicated to all things related to the Port Stephens region. We are passionate about Australia's blue water paradise, its beautiful sandy beach, warm clear waters and the unforgetable experiences that are waiting for all who visit. Our aim is to discuss Port Stephens, its history, its environment, its wildlife and its spectacular destinations. We hope that this website will inspire all who visit, just as much as Port Stephens has inspired us.